Strictly speaking the term UFO refers to any ‘unidentified flying object’, but in the minds of almost everyone it means just one thing: an advanced spacecraft visiting the Earth from another planet. Despite the absence of unambiguous, objective evidence this notion has become a mainstay of popular culture, tabloid journalism and the internet. How did this extraordinary situation come about? That’s not a question for an astrobiologist or aerospace engineer, but for a social scientist like David Clarke – a senior lecturer in journalism at Sheffield Hallam University, with a Ph.D. in cultural tradition and folklore. 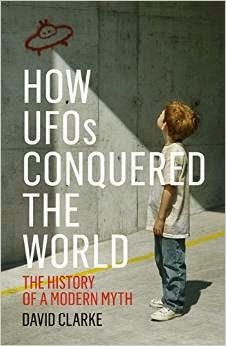 In this well reasoned and carefully researched book, Dr Clarke focuses on what he calls the UFO syndrome: ‘the entire human phenomenon of seeing UFOs, believing in them and communicating ideas about what they might be’. The phrase ‘I want to believe’ was popularised by the TV show The X-Files in the 1990s, and it encapsulates the very heart of the UFO phenomenon: people want to believe in it. Mysterious objects seen in the sky are just part of a complex belief system that has evolved over the last seventy years into a remarkably robust edifice. The psychological term ‘cognitive dissonance’ – whereby a firmly held belief may actually become stronger when the believer is confronted with conflicting evidence – was originally coined in the context of a UFO cult in the 1950s. The X-Files went on to provide one of the most powerful tools in the cognitive dissonance arsenal, by popularising the idea that ‘They’ (the government, NASA et al) are actively concealing the truth about UFOs. This hypothesis – which Clarke points out is unfalsifiable – allows any awkward counter-evidence to be dismissed as ‘disinformation’. The mainstream media, like science fiction, has been instrumental in shaping the UFO phenomenon. Before the term ‘UFO’ was coined, unidentified flying objects were commonly referred to as ‘flying saucers’. Sightings were invariably described as being exactly that – flying objects in the shape of saucers. Yet the term ‘flying saucer’ originated as a journalistic misunderstanding, before anyone ever reported seeing a flying disc-shaped craft. In June 1947, a pilot named Kenneth Arnold observed a strange formation of nine semicircular or crescent-shaped aircraft moving ‘like a saucer would if you skipped it across water’. The journalist who first wrote up the story used the term ‘flying saucer’ – and it was only after this that people began to see saucer-shaped craft. The book’s ten chapters cover all the major themes of ufology, ranging from lights in the sky to crashed saucers, government cover-ups and alien abductions. David Clarke is a strong advocate of Occam’s Razor, arguing that in all the cases he has encountered there is a simpler, more mundane explanation than the (admittedly more appealing) extraterrestrial hypothesis. That may sound all very dull and negative, but actually the opposite is true – it’s a fascinating account of the way perfectly normal people can have their perceptions and preconceptions shaped by what has become, as the book’s subtitle says, a modern myth. This isn’t a book for UFO believers, who will see it as a systematic attempt to kick over all their carefully constructed sandcastles. The fact is, however, that Clarke doesn’t kick over any sandcastles at all – he simply looks at them with closer scrutiny than their builders would like. To continue the metaphor, it’s a book for people who are prepared to admire sandcastles without needing to make-believe they’re real castles. If you’re the sort of person who would never dream of buying a book with ‘UFO’ in the title – this is the one that ought to change your mind.